Some ice is just ice. Other ice is satisfying and can completely elevate the experience of taking a drink. Do you want to enjoy a perfect cocktail at home or in your restaurant? Do you want to enjoy a crisp glass of water and enjoy the ice just as much? You need a nugget ice maker machine! Have you ever had a drink from Sonic and enjoyed the spectacular ice? That’s the kind of ice these machines make. It’s softer and more porous than normal crushed ice. The ice is sometimes called Sonic ice or pebble ice and even chewy ice. Machines that make this incredible ice aren’t cheap, unfortunately. There are also some machines that claim to make this style of ice but actually fall woefully short. I did extensive research and testing and I was able to weed out the duds. Here are the top 6 best nugget ice maker machines available, including machines for a range of budgets and needs. 7.1 Why are nugget ice machines so expensive? 7.2 Nugget ice VS clear ice cubes? 7.3 How to make Sonic ice without a machine? 7.4 How do I clean my nugget ice machine? 7.5 Best one for home? No product reaches bestseller status without having something to offer. That’s definitely the case with this ice maker. It performs extremely well, especially considering the more affordable price point. It offers a lot of value, as it performs as well as much higher-end, professional nugget ice makers. There is even a smart sensor that identifies the fill level of the bucket and turns the ice maker on and off accordingly. Adding to the convenience, you can schedule your ice making with the FirstBuild app (IOS – Android). Using Bluetooth, it will start making ice at the ideal time. This feature is great to use at the end of the workday so you’ll have lovely ice ready for that perfect after-work cocktail as soon as you get home. Another strong selling point for the Opal is its speed. It takes only 15 minutes for the first nugget and can produce up to 1 lb of ice per hour. In all, the bin holds 2.5 quarts (3 lbs) of ice. The Opal Small Nugget Ice Maker is the best nugget ice maker for home or light commercial use. It is compact, affordable, and easy to use, offering similar quality to much more expensive commercial machines. If a small countertop machine isn’t enough for you, this Scotsman ice maker may be more your speed. This is a machine that is ideal for commercial use, as it performs extremely well and can produce 80 lbs of ice daily. Measuring 33.38 x 14.88 x 22.75 inches, this is a classy-looking machine that fits well under a counter. The build quality is very high. 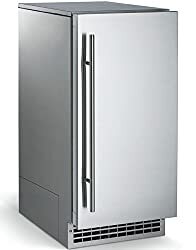 It has a stainless steel door with a tall refrigerator-style handle. A convenient scoop for the ice hangs on an interior wall. The box is fairly well insulated and the up to 26 lbs of ice it holds will stay good for close to a week. Installing the Scotsman is fairly easy and will likely only take a few minutes. It’s also easy to use. The control panel lets you know when it’s out of water or time for a cleaning. It has a built-in drain pump, meaning you don’t need to connect it to a drain. That means it could even be installed outside in an outdoor patio bar area or even on an RV or a boat if you have room. Although this machine could easily be part of any kind of commercial setup, it would also work perfectly well in a home setting. It’s especially good if you want to feel like you’re at a fancy bar when enjoying a drink at home. It’s pricey, but the Scotsman SCN60PA-1SS is well worth it with its high quality, capacity, and ease of use. Building a new home or renovating your kitchen or bar area? Adding an under-counter nugget ice machine is one of those special touches that you’ll really appreciate. 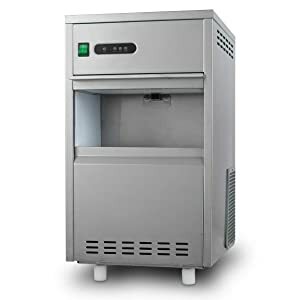 This Ice-O-Matic machine is ideal for installing as a permanent part of your kitchen or bar setup with its 33.4-inch height and stainless steel finish. Installation is fairly easy although the included instructions are unfortunately rather mediocre. Depending on your plumbing and the location of your drain, you might need to purchase an optional pump. This air-cooled unit features a small, self-contained condenser. Because it is air-cooled and thus optional for indoor use, this unit isn’t a good choice for a patio bar area. The ice capacity is 85 lb. When full, the unit will automatically stop making ice. Operation, in general, is very straightforward. The quality of the ice itself is top-notch. This unit also really stands out for its quiet operation. A lot of nugget ice makers are pretty noisy but this one is extremely quiet. If you want a large-capacity nugget ice maker for permanent installation under a countertop, the Ice-O-Matic GEMU090 Pearl Self-Contained Ice Machine is definitely worth looking at. This kind of ice is ideal for ice baths, so it’s a great home machine for a serious athlete who often uses ice as part of recovery. 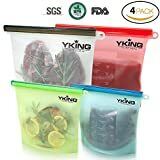 Although this isn’t the soft, fancy ice that adds flair to a cocktail and even makes drinking a glass of water more enjoyable, it is pretty close and can certainly can be used for drinks. It’s definitely a big step up from the standard ice cube. If you like that restaurant-quality ice, this is a good starter machine that will get you closer. It can make up to 44 lbs of ice daily and it has the capacity to store 11 lbs. A door allows easy access to the ice and a nice ice scoop is included. It’s easy to use and it starts producing ice in minutes. This is not the kind of unit you can just add water to so you will have to hook it up to the waterline. While this could potentially be installed under a countertop, that position could easily lead to overheating due to the lack of air circulation around it. The stainless steel finish is nice but the design looks a bit more industrial than residential. The affordable Bourkeliving Snow Flake Ice Making Machine isn’t going to make that Sonic-style ice you’re looking for exactly but it does make great ice that’s much nicer than standard ice cubes. Nugget ice is nice for cocktails but it also can elevate even a simple glass of water. This ice maker helps you with both the water and the ice. With a lovely stainless steel finish, this countertop model looks great and will fit in with your other stainless steel appliances. It features an air-cooled, self-contained condenser. A high production capacity is a big selling point with this model. It can make up to 315 lb of pebble ice in 24 hours. Ice production doesn’t take very long once you start it up. The storage bin can hold up to 10 lbs of ice. It’s very easy to use. You select if you want just water, just ice, or both water and ice and then hold your cup against the lever underneath the spigot. If you and your family want to start drinking more water, this water and snowflake ice dispenser will help you achieve your goal. There’s just something about the crisp and refreshing quality of a glass of water with this style of ice. That it makes getting water easier than ever only adds to the appeal. Manitowoc specializes in making ice machines and that focus really shows in the quality of the ice you get. This unit would work well in a hotel lobby or a gym but it’s also great for your home. The Manitowoc CNF-0201A-L is pricey but it has a lot going for it. 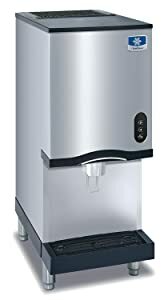 It’s well-built, dispenses both water and ice, uses a convenient lever mechanism for dispensing, and offers a high production capacity. For the average home bartender, buying a pro-level pebble ice machine might be too big of an expense. If you’re just getting into the art of mixology, though, you’re probably wishing you could have that perfect pebble ice experience that you get when you’re enjoying drinks at a bar. For the budget home bartender, you do have an option. You won’t get ice exactly like you’d get from one of these expensive machines but this ice maker combined with this affordable ice crusher will help you get a bit closer. This countertop ice maker from igloo lets you make ice in 3 sizes: small, medium, and large. You’ll probably want to choose small if your end goal is to get as close to that chewable nugget ice as possible. Portability is a selling point with this ice maker. You could even bring it with you on the boat or camping. Use a generator to power the machine and you can have fancy cocktails by the campfire. The bucket holds up to 2.2 lbs of ice. It can make up to 26 lbs of ice in a day and it can make a batch of ice in as little as 6 minutes. The next step of the ice making process for the budget home bartender is using a manual ice crusher. This low-cost hand crank ice crusher will get your ice into a consistency a bit closer to your goal. As you turn the crank, the stainless steel blades crush the ice. Depending on how much you crush it, the ice will be either coarse or fine. It might be a bit more work but for the price, you can’t beat it. The ice won’t necessarily be perfect but it will be good enough for a lot of hobbyist bartenders. The Igloo ICE103 + Manual Ice Crusher combo is a perfect budget solution for the home bartender although it will take more work and the overall capacity is much lower. Why are nugget ice machines so expensive? It’s easy to think that an ice maker is a simple machine. In reality, they are more complex than the average refrigerator. They are made up of fairly pricey parts and materials, including copper, refrigerant, control boards, pumps, compressors, and stainless steel. Nugget ice machines need to create ice of a very particular size, shape, and consistency and they need to do this fairly quickly. To make Sonic ice, these ice machine first start by freezing ice in small sheets. The small flakes of ice that protrude are scraped off and these flakes are then compacted into little nuggets or pebbles. When you really think about it, the price tag starts to make sense. And personally, I think it’s worth every penny. It sounds like an exaggeration, but ice like this can really change your life. If that’s going too far for you, it can at least make having a drink more enjoyable. Nugget ice VS clear ice cubes? This comes down to a matter of preference. Both nugget ice and clear ice cubes are gourmet ice and both work well in different kinds of drinks. Clear ice is made through a unique freezing process that eliminates air. Unlike a standard ice cube, these cubes really are clear and this definitely has a bit of a wow factor. Clear ice cubes look classy and fancy and there’s something about this that can just make drinks taste a bit better. What makes nugget ice different is the size and the texture. This ice is softer and smaller. It is known for being chewable and for its flavor retention abilities. Nugget ice is particularly good with soda and cocktails like the mojito. How to make Sonic ice without a machine? It’s impossible to make true Sonic ice without a machine. That said, you can make ice that is somewhat similar to that chewable ice you love. Crushed ice isn’t the same as nugget ice but when you crush normal ice to a certain consistency, it’s pretty close. You can use a manual crank like this one by Vitorio Kitchen Products. You will need to crush the ice until it is quite fine. Another option is using a Lewis Bag and wooden mallet, a special tool used historically for this purpose and still popular today with some bartenders. For a DIY version of the Lewis Bag concept, you can crush the ice by putting it inside of bag or wrapping it inside a tea towel and then hitting it with a hammer. The finely crushed ice you end up with isn’t quite nugget ice but it’s a lot closer than standard ice cubes. Another way to get Sonic-style ice at home without a machine is to start with fizzy water. Make ice cubes from club soda. The fizzier, the better. Those big bubbles will help you get the porous ice texture you want. Don’t make full-size ice cubes. Keep them on the smaller side. After making ice from this fizzy water, you’ll need to crush the ice, using one of the methods described above. With this kind of carbonated ice, you can even successfully get the size and texture you want by simply putting it in a glass and muddling it. How do I clean my nugget ice machine? All nugget ice machines need some regular maintenance, including descaling. In some cases, like with the Manitowoc CNF-0201A-L, there is a high-tech self-cleaning mechanism. Whenever the machine needs to be cleaned, it will notify you and then you can authorize the start of the self-cleaning process. For other nugget ice machines, you’ll need to take a few additional steps. Here is a detailed tutorial for how to clean the Scotsman SCN60. 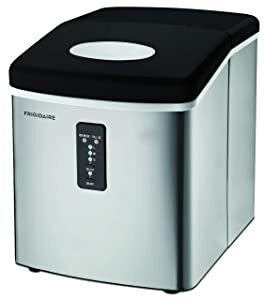 This will be a pretty similar process for all nugget ice machines although you will need to follow the instructions in the manual for your particular model. If you don’t perform the recommended maintenance including cleaning, your nugget ice machine might not last as long as it would otherwise. Considering the big investment, you definitely don’t want this to happen. Another good reason to regularly clean your nugget ice machine per the instructions is that your ice won’t taste as good when the machine is in need of a cleaning. This is an impossible one for me to answer because it really comes down to different needs and preferences. The right one for my home might not be the right one for yours. The 6 listed above are all good options for home use, representing a range of budgets, aesthetics, and features. 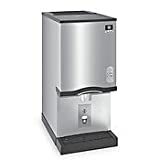 For families, the Manitowoc CNF-0201A-L Water And Snowflake Ice Dispenser might be the best option because of its large capacity, ease of use, and the fact that it can dispense water as well as ice. If you’re building a new home or you’re undergoing a kitchen renovation, the Ice-O-Matic GEMU090 Pearl Self-Contained Ice Machine might be the best option for you since it works so well as a built-in, under-counter unit. 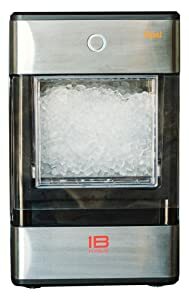 If you don’t have much to spend, the Igloo ICE103 + Manual Ice Crusher is a good budget option that will get you closer to Sonic ice until you can afford a true nugget ice machine. 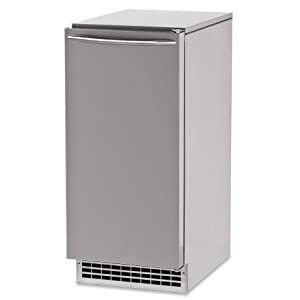 For a lot of homes, the bestselling Opal Small Nugget Ice Maker is the best choice. It has an affordable price, makes very good ice, and quite compact. Which of these nugget ice makers would be best for your home? Let me know in the comments. Feel free to share this list with anyone you know who enjoys a perfect pebble ice cocktail. You might want to share it with loved ones as well, hinting that it would make a great present for you! Do you have any other questions about Sonic ice and nugget ice maker machines? Feel free to ask in the comments and I’ll do my best to answer you.